Does your soccer ball lose air after just 10 or so minutes of game time? Do you find yourself pumping it up every time you play? Or does it fail to hold any air at all? Having a broken ball, particularly an expensive official match ball such as an Adidas Jabulani, Teamgeist, Europass, Speedcell, Brazuca, Beau Jeu or Telstar can be incredibly frustrating. In this tutorial, we’ll show you how to fix a soccer ball – no matter the reason it’s losing air. First you must determine why your ball isn’t holding air. In some instances this is obvious, for example you may notice that your valve is letting out air. If it isn’t so obvious, follow the steps below. Fill up a sink or a tub that’s big enough to hold your ball with water. Rotate the ball, looking for air bubbles. Notice where the bubbles are coming from, this indicates where the leak is located. Completely dry the ball once the leak is found. This is particularly important if you are going to glue a puncture in the ball. This Speedcell has a leak in between its panels and its valve is also broken. First we’ll be using the sealant method, and then we’ll be replacing the valve. Now you know exactly where the leak is coming from. Either the valve is letting air out, the actual bladder is punctured, or the ball has a hole in one of the panels itself. If air is seeping slowly through a gap in between panels (as shown above) the bladder must be resealed. If the valve is broken it must be replaced. If air is leaking through a puncture in the ball this puncture must be mended with glue. Remember you can try more than one of these fixes to achieve the best results! Most minor leaks without a clear puncture hole (ie, air escaping between numerous panels) occur because the internal rubber bladder of your ball has a small hole. Bike tire sealant (we’ve found Stan’s Notubes to be quite effective). Contact cement (you might need a syringe to insert it as it can be quite thick). Egg white (yes, this can actually work!). We’ll be using bike tire sealant in this demonstration as it works well and is easy to insert. Note: you’ll probably also want some tissues or a cloth as you’re about to see. Now you’re ready to repair your soccer ball! Let some air out of the ball (this will help to avoid the sealant blowing back out of the valve as happened in the video). Attach your spare pump needle to your sealant bottle, using tape if necessary. Alternatively, pour some sealant into your syringe if you’re using one (more on this below). 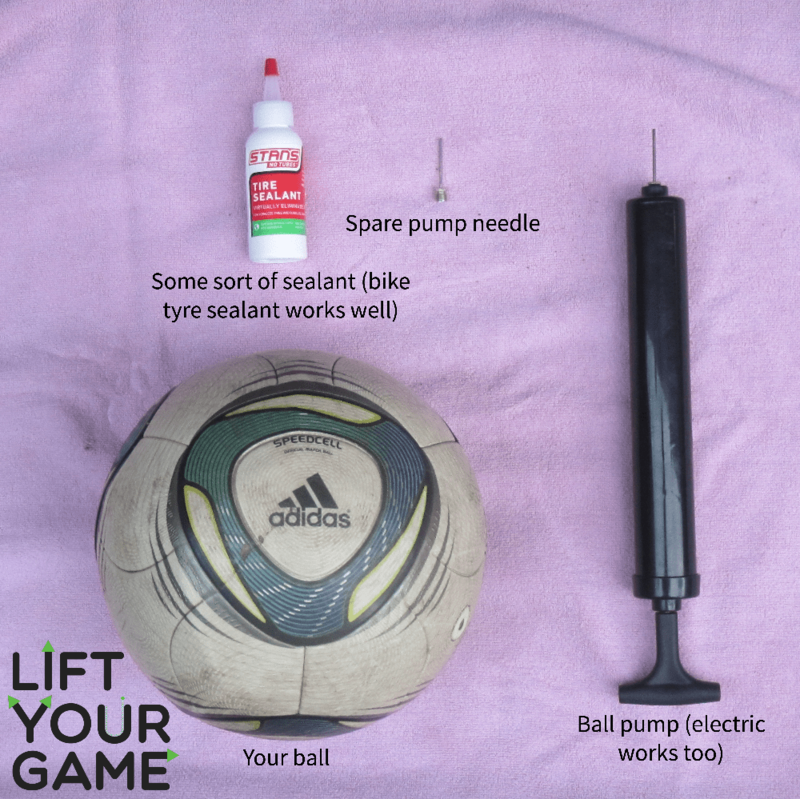 Push the pump or syringe needle into the valve and insert roughly an ounce (30 grams) of the sealant into the ball. Remove the needle and inflate your ball to the point where it can be rolled. Roll the ball so that the sealant coats the entirety of the bladder – make sure you get an even distribution. Take note of the drying time or usage instructions on the packaging. Leave the ball for 12-24 hours to dry. Try and keep it inflated during this time to ensure the bladder retains the correct shape as the sealant dries. Repeat as necessary if the first try hasn’t fixed the issue completely. 2-3 coatings may be necessary in some cases. Since we first published this article, people who tried this method have said that having a syringe on hand makes the process of inserting the sealant much easier. The syringes cyclists use to inject products like Stan’s Notubes into punctured bike tires can help you avoid wasting the liquid, as they have a long needle designed specifically for use with rubber valves. Hopefully this method helped to fix your ball’s leak! If not, you might like to try and to plug the specific area where air is coming out of your ball. At times the actual valve inside the ball will break due to general wear and tear, particularly on official match balls. Fortunately, replacing an old valve is relatively easy. pumpuptheball was kind enough to send us their combo kit to try, which includes 10 valves, a needle, and a valve removal tool. We used their product on an Adidas Speedcell (see the videos below) and it worked very well indeed. If your ball pump doesn’t look like our one, there are other ways to get the new valve into the ball. For example, you can use a thin Phillips-head screwdriver to force the valve through the hole. Using your valve removal tool, you’ll need to pull the old valve out of the ball. There’s a certain technique to using the hook – check out the video below to see how it’s done. Force the hook end of the tool through the valve opening – you should hear a pop as it pushes its way into the bladder. Tilt the hook to about a 45° angle and begin to pull. You’ll likely need to use a lot of force to get the valve out. Check to make sure that you’ve removed the whole valve. There are a few ways to get the new valve into the ball. What I like to do is put the valve in the hole, and then force it down with a ball pump. This way, the ball stays well-inflated which makes it easier to push with enough force. 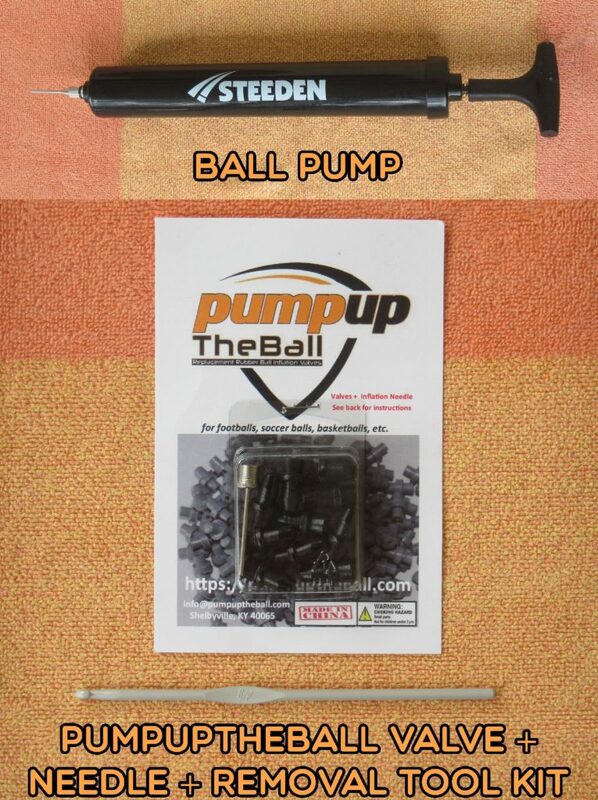 With pumpuptheball’s valves, you won’t need to use lubricant as their product has a slightly oily surface. If you’re using different valves, try Vaseline to make the process easier. Take one of your replacement valves and position it over the valve hole. Grab your ball pump and push the needle through the valve, forcing it down into the ball. Keep pushing the pump down while keeping the ball well-inflated. Ensure the valve is all the way into the ball and resting nicely in its notch. For most balls glue isn’t necessary. However, if you notice that the old valve was glued in as you pull it out, it may be a good idea to apply some polyurethane glue to the new valve as you reinsert it. We’ve all been there: playing the beautiful game, having a great time, without a care in the world, and then… a dog decides to eat your ball. Or perhaps an old nail on a goal post snags it. End result: air begins to leak out. My Jabulani was lucky enough to survive this dog attack! When a soccer ball has a specific hole that has pierced the bladder as well as the outer casing, the sealant method may not work as the hole will be too big to fix. In this case the outer casing must be repaired. Note: this method is best for official match balls, not replicas, as they have thermally bonded layers which are designed to be airtight. A stitched ball is not designed this way and so it’s best to use the sealant method to fix the bladder itself. Polyurethane glue (Gorilla glue shown below is great for this). A thin metal needle, like a knitting needle without a sharp end. Now you can begin the process. Deflate the ball slightly so the surface be easily pushed in. Locate the puncture. Using the kitchen paper, rub the area with isopropyl alcohol to ensure that the glue adheres nicely. Apply some glue to the end of your needle, using it to rub the adhesive into the hole or between the panels. Try to avoid having the needle vertical in relation to the ball to avoid further damage to the bladder. Push the sides of the ball in so that air flows out through the glue. As the pressure subsides glue will flow into the hole. Repeat this process 2-3 times, adding more glue in between. Clean off excess glue and inflate the ball a bit. Leave the glue to dry for 10-20 minutes. Now you must begin layering the glue around the hole more generally to ensure it remains strong in the long term. Rub glue around the hole with your finger, but be careful not to apply too much adhesive. Leave the ball for 30 minutes, then add another layer and leave the ball for 12 hours. Next, add a final layer and leave the glue to dry for 24 hours. Keep the ball inflated during this process so that the seal is molded to the shape of the ball. This method requires some experimentation. If the ball still doesn’t hold air, try again but with more glue layers or a different type of glue. Make sure that the glue has fully dried before testing it again with the water method. Hopefully you managed to fix your soccer ball! If you still need help, contact us or leave a comment below and we’ll get right back to you. Thinking of buying a new ball instead? Check out the best soccer balls for sale at the moment. Basically, I’m concerned about the product which I recently bought, the 2018 UEFA champions league official MATCHBALL. When I got home, I took the ball out of its box and kicked it around my lounge room. A few hours later, I noticed that the ball had noticeably less air in it. It wasn’t flat, but by pressing it with my fingers, I felt there was less air in there. Is this because I kicked it? I have another soccer ball that’s been sitting on its own for months now, and hasn’t leaked as much as as this new MATCHBALL I bought. I’m concerned whether this is normal, and whether it is supposed to happen at first for a high-end matchball like this. Can you please provide me with your knowledge on this? For whatever reason, some official match balls tend to lose a little bit of air over a short period of time – they can feel a bit flat 3-6 hours after pumping them up. It’s not to do with whether you use it or not, it’s due to the design of the bladder. Two of my Jabulanis and my Nike Incyte will lose air after a few hours of use. These days I take a pump to the pitch if I’m going to be staying for over an hour. Since your UCL ball is brand new, you might be able to tell the seller that it’s not holding air and get a replacement. The product might technically be faulty, depending on how quickly it leaks. If this isn’t possible, you can fix the issue by squirting a little Stan’s Notubes through the valve (as we did in this tutorial). The Speedcell shown in the videos on this page had a major leak and wouldn’t hold air for more than 5 minutes, but now it retains its shape for more than 24 hours. However, I have one more concern about the ball, would you know the answer to this? Basically, you know how the panels on UCL balls are thermally bonded, right? If I look closely, I can see a reasonable amount of glue in between some panels. The glue itself feels hard, and is not sticky. 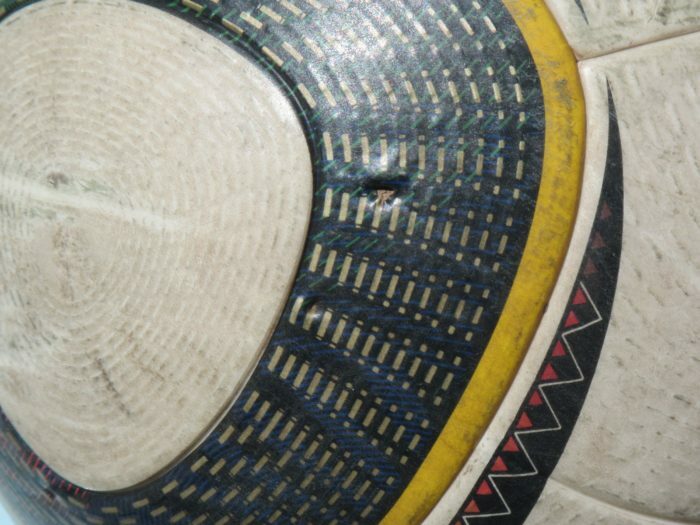 Is this normal, and do you see this on any of your matchballs? I’m worried because the box in which the ball came in was previously open, which means that someone must have bought it and returned it to store…it is possible that the person saw a leak in some of the panels and filled it with glue, then returned it to the store. If that is the case, then there is definitely something wrong with the ball…sorry if I seem a bit paranoid, but I just want to be sure on this expensive purchase. Can you please give me your knowledge on this? If it’s just leaking a bit and feels soft after a few hours or so, it’s up to you how much of an issue this is. For me personally, I don’t mind it too much. But if it bothers you, use a little bike tire sealant to fix the problem. With regards to the glue, I know that feeling! I bought a used Teamgeist 2 around 6/7 years ago and it had glue in the seams. I messaged the seller and he said he hadn’t done anything to it – it held air well and I still use it today. A few years later I got my hands on a brand new Europass 2008, which is identical to the Teamgeist 2, except for the color. And guess what? There’s glue in between the panels – it comes from the factory. Surprisingly not all Adidas balls have it, I know the Brazuca and Jabulani don’t. As long as your seams look the same and have a sort of dull yellow/clear glue that feels hard to the touch (as you described), it hasn’t been tampered with. Hi, great article. Is there any way of fixing a ball where the valve has been pushed inside the ball? My son tried to pump up his football and managed to push the valve inside so you can hear it rattling (and the ball wont inflate). Hi Jon, if the valve has been completely dislodged from its hole (and is rattling around inside the ball) you could try to force a new valve in there (the ones we used in this guide go in quite easily). You might find it quite hard to get the old valve out of the ball, so it’s probably best to leave it in. However, if the valve holder has been damaged, it might not be able to hold the new valve. On your Europass, that glue along the seams is similar to the ones on my ball. However, the quantity of glue on mine is noticeably less compared to your’s. I could only identify 4-5 panels which have some noticeable glue sticking out. The glue itself, unlike in your photo, is a pale whitish colour, almost like hot glue after it sets. Maybe that could be because the UCL matchball is a newer ball compared to the Europass, so they modified the colour of the glue? Anyway, I pumped the ball up left it for a day. Then, I kicked it for like 10 min around my lounge room- juggling, heading, and rebounding it against the couch…it’s been like 2 days now since I pumped it up, and 1 day since I kicked it. The ball doesn’t seem to be losing as much air anymore. In fact, it seems more stable and has retained its air reasonably well. That should be a normal sign right? I’m gonna kick it again for longer, and see if the ball loses air. If it does, to a worrying amount, I’ll have to take it to the store. But if the air remains stable, then the ball should be fine, right? I still think you’re fine, as long as you bought the ball somewhere reputable. My theory is that when they glue the panels to the second layer, some of it is forced up through the seams as the panels are pushed on. Like with your ball, on mine the glue isn’t visible on every gap. I’d say two-thirds is covered. It’s entirely possible they used more glue when making the Europasses and have now switched to a less noticeable white substance (it has been ten years, after all). If it holds all of its air for 12+ hours and gets a tiny bit soft after 24 hours, I’d say this is pretty normal. Every single match ball I own needs reinflating every one/two days to keep it completely hard. There’s only really cause for concern if it’s happening very quickly – within 1/2 hours. I’m not sure if I’ve ever had balls get better over time as they’re “broken in”, maybe the new UCL balls do that. Try and kick it around for another 10 minutes – if you haven’t needed to pump it up for two/three entire days (including two/three indoor play sessions) to keep it reasonably hard, you should be fine. Now, it’s been a few days since I last pumped the ball. I kicked it a few times around my lounge, and it doesn’t seem to be losing air anymore. If there is a problem with the ball, it is most likely an internal hole in the bladder, or air is leaking through the panels. Can I use the water submerging method to identify if that is happening? If so, I’ll take it back to the store and return it. Also, in your instructions, you said that the whole ball should be submerged in water. Wouldn’t that make water go into the valve, and into the bladder? It’s no problem, glad to be of assistance! Doing the water test is a good idea. The issue is most likely one of those slow bladder leaks since it’s a new ball. You’ll see a small amount of air coming through the gaps in the panels, rather than through the actual panels themselves. If you do spot air coming out of the valve or gaps in between the panels when the ball is underwater, this doesn’t mean water is going in, it just means air is coming out. As long as the ball is pumped up, the air pressure will be too strong to let water get into the ball – the valve I believe is supposed to be airtight and therefore watertight anyway. If there are leaks you can claim it’s faulty and hopefully get a new one or a refund. Otherwise you should be good to start using it. If you do use it at the pitch and it begins leaking really quickly after extended periods of use you can always fix it yourself. Last week, I went to the store and exchanged my 2018 UCL ball for the 2016 one which was actually on a clearance sale for 50%. I took an inspection at the ball, and it seemed to be fine. It wasn’t leaking air as quickly as the 2018 one. However, there is one minor problem I notice on the ball: there’s a small cut on one of the star panels (about 0.5cm in length). It resembles a paper cut on your skin, it doesn’t go deep into the ball. Although the wound isn’t open and is only small at the moment, I’m afraid that the cut could expand when I take it out to the pitch and play with it. Would you know how to resolve this issue? How can I prevent the cut from getting worse than it is? You’ve stumped me with that one! I don’t believe I have any used or newer match balls with thin cuts on the panels like that. The closest thing I’ve had happen was dog bite marks on a Jabulani which didn’t expand after a few years of using the ball. I’ve also had a really thick gash on a cheaper ball which hasn’t enlarged over time: https://liftyourgame.net/wp-content/uploads/scarred-soccer-ball-1024×768.png. I think if the cut on your ball is quite thin, it’s unlikely to become any larger. If it does expand, you should be able to get a refund under consumer law if the store refuses to take back a used ball. However, in saying this, you really shouldn’t have any defects like this on a brand new ball. Although it probably won’t become a problem, there’s a chance it might. Considering the ball would be fairly expensive (even at 50% off) it’s probably worth trying to exchange it in my opinion. It would be quite difficult to fix by yourself – you’d need to glue the outside of the ball, which would affect how it performs in the air. Unfortunately, at the moment, im quite hesitant to take it back to where I got it from since its quite a long drive…although the ball is from 2 seasons back, there seems to be nothing wrong with it. I don’t know where the cut originated from, maybe it hit a sharp edge when I kicked it? I was thinking of using a little bit of masking tape (1cm* 1cm) to stick it over the cut so that when it comes in contact with the ground, the friction won’t cause it to enlarge. Does this sound like a good idea, it shouldn’t affect how it performs in the air, would it? If you want to use it, that’s fine, as you should be covered under state/federal consumer law. If the gap starts to split obviously the ball is faulty and therefore you should be entitled to a refund (but I’m not a legal expert – you should research what coverage you’d be entitled to). The cut most likely came from the ball being moved sometime during the two years it’s been sitting in a warehouse/shop somewhere, unless you’ve got a kitten with really sharp (but thin) claws or something like that. Tape should protect the gap but it’ll likely come off pretty easily. 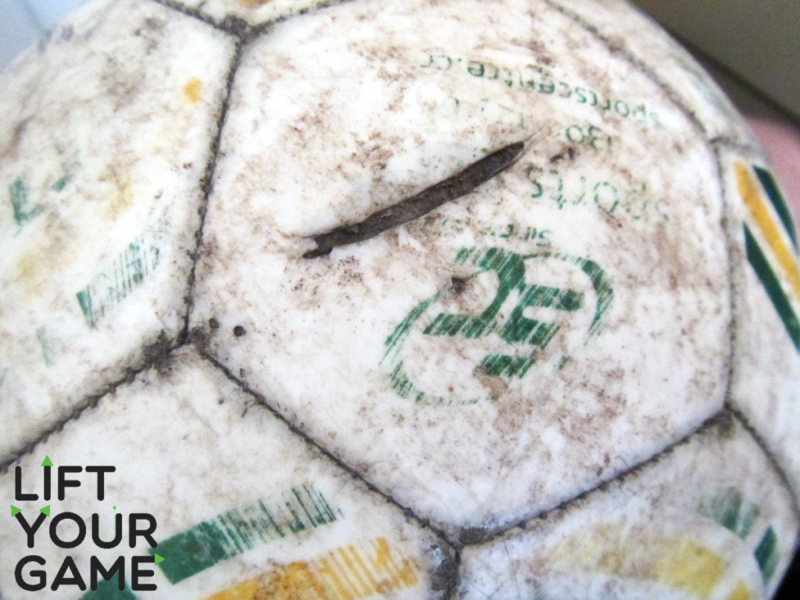 It’s up to you whether you’d be annoyed replacing it every 3-4 times you use the ball outdoors. A piece that small won’t affect the performance of the ball. Thanks a lot for your advice, I don’t think there’s anymore problems with this ball! Glad to hear that! Feel free to let us know if you need any further help with this ball (or others) in the future. Hi, I bought a Nike Incyte off eBay a month ago or so. The valve was leaking from the start but, the seller didn’t accept so I decided to make do. What I used to do was poke around the valve with the needle and it would sometimes stop. That seems to no longer work for me. Do you have any recommendations on how to replace the valve of a Nike ball? The all seem to have the valve inside that actual ball themselves. Thank you. Hi Hector. As we understand it, Nike’s valve are the same as Adidas’s ones – meaning they have their own little notch inside the ball that you can pull them out of. From what we’ve seen, they can be removed and replaced using the method on this page. Have you tried to remove the current valve with a crochet hook? If you can’t hook it out from under, you may need some thin pliers to pull it out of the ball. Hey, can we really fix soccer ball using egg white & syringe? Please tell me whether it is true or not. In our experience, it’ll only work if the hole in the bladder is really small. It’s best to inject bike tire sealant instead for best results. Is it necessary to use isopropanyl before using gorilla glue? And which type of gorilla glue? Super? Epoxy? Using rubbing alcohol beforehand is highly recommended, because balls tend to pick up dirt/debris which can prevent the glue from sticking. Gorilla super glue tends to work best (the clear stuff). Hi, I have a 2011 champions league official match finale ball and it’s been sitting in my backyard for years and now the stars/panels are starting to come of the ball, also when I tried to put air on the ball it would loose air and the leak is inside the panels/stars and 1 more thing. I don’t remember if the ball came with a rubber air valve or not because it’s just one little hole for the ball pump to go in instead of having a rubber air valve. Sorry if this is long but any advice or tips ?? Pump up the ball and put it in some water (if you haven’t already) to verify that it’s only leaking in between the panels. If the panels are only peeling a bit and aren’t coming off completely, we’d recommend inserting bike tire sealant through the valve to try and fix the bladder. You probably don’t need to worry about replacing the valve unless air is coming out of it. Most balls are like yours – the valve is pre-inserted – so this isn’t anything to worry about. If adding bike tire sealant doesn’t work, you might need to reglue the panels back down. One of my official match balls loses air over a few hours after being pumped full. I want to find and fix the leak just for whatever reason in the future that it would need be fully inflated it will be. However at the moment it’s fine as it as for display purposes. Would submerging it in water damage this ball that hasn’t been used before? Furthermore are the risks worth it or am I best just leaving it as it is? Like I say I am fine with it losing air but for the sake of mindfulness I wouldn’t mind fixing it. If it’s an official match ball that was made within the last 10 years or so, you should be fine to submerge it. The only reason you wouldn’t want to do this would be a). it’s a really old ball (made of leather or something that’s not totally waterproof) or b). the thermally-bonded seams or the panels themselves are beginning to deteriorate with age, and water might make the ball’s outer shell flake a little. So if the ball is in perfect nick, don’t be afraid to wet it. Just be sure to dry it properly when you’re done. I have a Jabulani matchball replica – Glider. It’s quite old but was in decent condition until recently. I hadn’t used it for a few months so it was completely deflated. I tried to fill it up again, but I can no longer find the valve opening. The pump needle goes right through the outer opening, but I can’t locate the inner tube at all. Even while shaking it, there is no sign of the valve inside. Is the ball beyond repair or can I still fix it? The only thing we can think of is getting some sort of hook (like the crochet hook we’ve used in this tutorial) and trying to pull the bladder back into place. It will be difficult though – might be better to just get a new ball. We too have this issue with our new UCL 2018-19 Adidas Official Matchball. Kicking it around it loses maybe 3-5% of its air. Let it sit for a day or two and it is what I’d consider flat. I don’t mind re-inflating after a day, but a ball shouldn’t change in air pressure from being kicked around for an hour. I’ll try to submerge it next to see if there are any visible leaks. Hi, I have a Nike Strike ball, new, & it makes a hissing sound of air escaping when I pump it, but it doesn’t seem to have lost any air within the day. Would this be normal or might it be faulty. No flattening so far but when I pump it leaks very slowly. Might it just need to be broken in? Thanks for any info! Hi Jose, what’s probably happening is the needle is leaving a gap in the valve hole, so air is escaping as you pump it up. If you’re still able to inflate the ball, and it’s not leaking during the day, it’s nothing to worry about.